Effects of weakening farm income continued to ripple through farm economy in fourth quarter. Farmland values in both the Seventh and 10th Federal Reserve districts dipped again in the fourth quarter of 2015. According to respondents of the 10th District "Survey of Agricultural Credit Conditions," values of non-irrigated and irrigated cropland decreased 4% and 2%, respectively, from a year ago (Chart 1). The Seventh District reported an annual decrease of 3% in “good” farmland values. 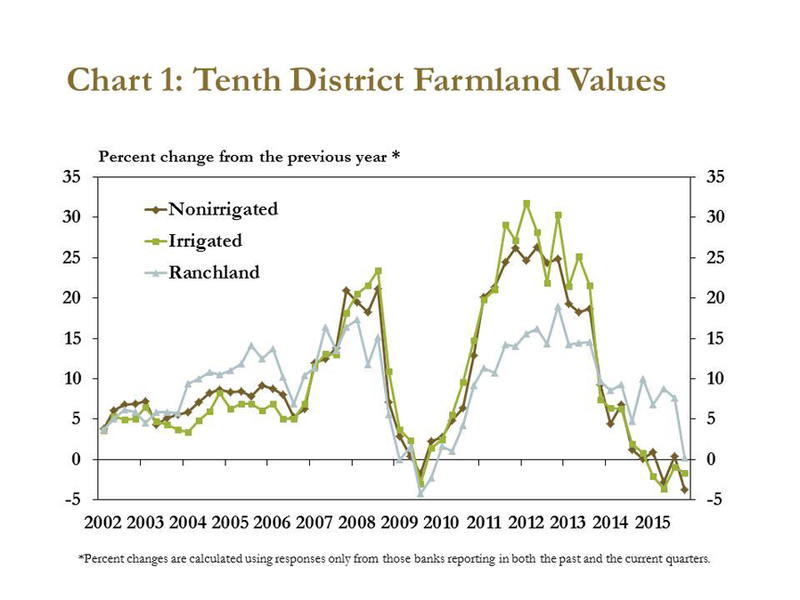 The fourth-quarter declines in the 10th District meant that irrigated cropland values fell modestly in four consecutive quarters, and the value of non-irrigated cropland generally followed the same trend throughout 2015, reported Nathan Kauffman, assistant vice president and executive of the Fed's Omaha, Neb., branch, and Matt Clark, assistant economist. The 10th District report notes that growth in the value of ranchland also stalled in the fourth quarter, alongside sharp declines in cattle prices that persisted to the end of the year. Oklahoma and Wisconsin were the only states where bankers reported increases in average cropland values compared with the previous year. Ranchland values also continued to rise modestly in Oklahoma, in addition to the Mountain states. Changes in farmland values in most other states, however, generally were consistent with average changes for the 10th District as a whole. Respondents to both the Seventh and 10th District surveys expect farmland values to fall further in the coming months. In fact, bankers in the 10th District expect the value of each land type — non-irrigated cropland, irrigated cropland and ranchland — to decline again in the first quarter of 2016. The volume of farmland sales in the 10th District also dropped in 2015. Historically, changes in the volume of farmland sold and farmland values have moved together. Similar to farmland values, 10th District cash rents softened in the fourth quarter. Cash rents for both non-irrigated and irrigated cropland edged lower, at a pace similar to recent quarters. In contrast, ranchland cash rents continued to rise modestly but are expected to soften in the coming months, along with other land types. Kauffman and Clark said reduced farm income has likely contributed to expectations of further declines in both farmland values and cash rents. In the fourth quarter, 87% of 10th District survey respondents reported lower farm income than a year ago, and this was consistent across states in the district. In fact, for the first time since 2002, Kauffman and Clark said bankers in all 10th District states reported that farm income in the fourth quarter was lower than a year ago. Bankers expect farm income to remain subdued in the coming months. For the second quarter in a row, bankers indicated that they expect a further decline in farm income in the coming quarter. According to Kauffman and Clark, these expectations for lower farm income continue the trend of reduced incomes in Kansas, Missouri and Nebraska but mark a significant downturn in expectations for future farm income in Oklahoma and the Mountain states. Farm credit conditions in both the Seventh and 10th Districts also slightly deteriorated in conjunction with lower farm income. Kauffman and Clark reported that farm loan repayment rates slipped further in the fourth quarter, while farm loan demand remained high. Additionally, loan demand and repayment rates moved in similar directions in both districts. “Through the fourth quarter, softening repayments rates and strong loan demand appeared to be a reflection of persistently weaker farm income and reduced cash flow,” Kauffman and Clark noted. Despite these conditions, commercial banks generally continued to report low delinquency rates on agricultural loans, as shown in the first-quarter "Agricultural Finance Databook" from the Federal Reserve Bank of Kansas City, Mo. Softening farm income and consistently strong loan demand appeared to also reduce credit availability for some borrowers in the fourth quarter, according to Kauffman and Clark. “The fourth quarter marked the 11th consecutive quarter of increased loan demand and the second straight quarter of diminished availability of funds for agricultural loans. In addition to strong demand for farm loans, the recent surge in loan renewals and extensions and weaker repayment rates likely has reduced principal payments, thereby restricting the availability of funds for new loans,” they noted. Bankers in the 10th District also indicated that they expect credit availability to tighten somewhat in the first quarter of 2016, which would mark the longest period of reduced availability of funds at agricultural banks in the district since 2000. Senior business economist David Oppedahl said there was strong sentiment among survey respondents in the Seventh District that the downward trend for capital spending on farmland or land improvements, buildings and facilities, machinery and equipment and trucks and autos would continue into 2016. Additionally, he said survey respondents noted that controlling costs and utilizing risk management tools will be critical to the health of farms in the coming year.